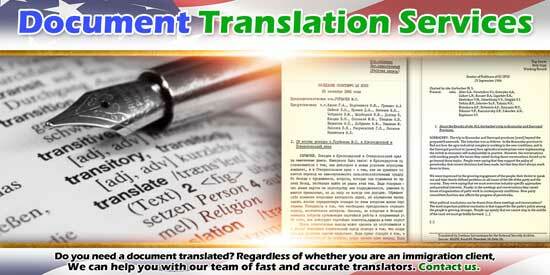 Do you need document translation services? If you live in Montana, North Dakota or Wyoming, we can help you with document translation. However, we do not translate documents ourselves. But, in 20 years of practicing immigration law, our clients needed many documents translated. Moreover, many clients needed certified document translation services. We have developed relationships with the best, and fastest translation services. You do not have to be a client of ours for us to help you with our translation services. Translation services are one of the miscellaneous services we offer. If you also need the translated document authenticated with an Apostille, we can also help you with our Apostille Service. If you know you need help now, contact us, otherwise, please keep reading for more information on how we can help you. In helping our immigration clients get their documents translated, we had to find certified document translation services or document translation services for immigration. The United States Citizenship and Immigration Services (USCIS) has strict requirements about the quality of translation services. Not any translation company will do. Only those translation companies that offer legal document translation services or certified document translation services are acceptable to the USCIS. The USCIS requires that the translator certify that the document is correct when translated from the foreign language into English. It also requires that the translator specify that it is fluent in both language translated and English. This certification must accompany the translated document. Such a certification is not worth much if the person translating claims fluency, but the document is not correct. We have seen one case in which the USCIS denied a person an immigration benefit for using a poor quality translation. Quality translations are often inexpensive. The document translation service fee will cost less of your time and money than having to provide another translation. If you need a document translated for a legal proceeding that requires accuracy and certification, we can provide you with a quote. Common examples of documents that you might need translated are birth certificates, marriage certificates, or a divorce decree. Please contact us for all your legal document translation services.